Saturday saw the 10th running of the Gateshead Parkrun at Saltwell Park and we decided to run round the course, take in the atmosphere and try to figure out why numbers have still to reach 100 when just a couple of miles away at the Town Moor, the Newcastle Parkrun averages around 300. There is no disputing that the course is a tough one but one thing that must be remembered is that the start and finish is at the same place so what goes up must come down! The event itself, similarly to the Newcastle event, is friendly, well organised and well marshalled, it's what you have come to expect from a Parkrun. The course consists of one small loop around the top of the park followed by 3 laps around the lake which is very undulating to say the least but if anything, it tests endurance and pace judgement. As 4 laps are completed in total there are a lot of people being lapped, something which could cause a problem if there were hundreds of runners but as the paths are pretty wide and marshalls at every corner, all you need is a bit of consideration from all parties and it doesn't cause a problem. The final half mile is very tough as there is a steep climb up to the finish but you can enjoy a flat 200m run in where you can stride out. Overall, after speaking to a couple of the organising team and other competitors as well as actually taking part, North East Runner cannot speak more highly of the run and would strongly recommend it to others. The natural thing would be to compare it to it's Newcastle neighbour - a flat course where you can get a very fast time if the weather is favourable. No, you wont get your fastest time at the Gateshead Parkrun but at the end of the day, does it matter? We found that times were around 45 seconds slower (towards the front of the run) than people would normally run but the course provides a good test and after all, as runners we are always looking out for tests and challenges. The run is completely traffic free, no gates to go through, no real tight turns, the running surface is safe and the run is set in quite a stunning setting. In addition, the event is very spectator friendly. As 4 laps are completed, friends and family can get to numerous points on the course to lend support. North East Runner verdict? Try it! 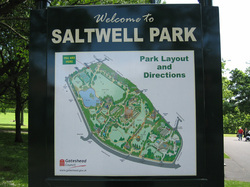 If you want to take a break from other Parkruns or have not done a Parkrun before then Saltwell Park is the place to visit. Today's event was won by Brian Hetherington of Wallsend Harriers, one of the areas leading veteran runners at the moment. It was his first visit to the Gateshead event and he was very impressed, commenting that it was tough but that's what you want - a challenge! There were 79 finishers in total, just 3 less than the record for the event, set on the opening day. The ladies event went to Jarrow's Vicki Thompson in a time of 23.23. Well done to everyone that ran and played their part in a very enjoyable morning. Please see our Pictures Galleries page for pictures from the day. If you have a story or want to get in touch then we welcome any feedback. Click here to let us know. Keep up to date with what the North East Runner bloggers are up to. Follow their progress and listen to their advice, Click here to read more. Here at North East Runner we offer expert advice on Training, Nutrition and Sports Injuries. Click here to read more. North East Runner is still very new and we are still gradually building up content. But how did it all start? Find out by clicking here.